One night, not long after we received our new to us furniture my hubby and I were happily ensconsed on the couch catching up on the Sarah Connor Chronicles. I got up for a quick bathroom run, opting not to hit the lights. So it was that just as I was settling in I saw *something* move across the room. Just as my subconscious decided this had to be the BIGGEST cockroach I'd ever seen I found the light switch. And found a mouse staring back at me. I yelled for the hubby who shut the bathroom door to try to corner him. (If you've ever had mice you know where this is going...) The little guy wiggled out under the door into our bedroom. After much running around the room, he manage to find himself a hidey hole, but we couldn't figure out where. So we stuffed a towel under the door, shut off the lights, and headed back to the couch to give him time to creep back out. It worked brilliantly, except for the part where when we came back in, he found the same hidey hole. Only now it was nearly midnight and we had a loose mouse in our bedroom. Eventually, we located him, hiding up inside the recliner. 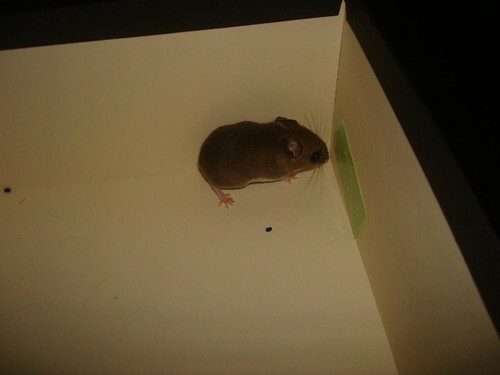 A good twenty minutes of "poke the mouse with various objects to try to flush him out" finally resulted in him making a mad dash right into the shoebox we had prepared! Aaaaaaand then leaping right back out of it and dashing for the door. Thankfully for me, my husband apparently has crazy mice catching skills because it was at this point that he reached out and caught it. By the tail. Epiloque: Our mousey friend was plopped back into the shoebox and escorted outside, away from the house. The hubby, understanding the import of this post, patiently stood outside at midnight snapping pictures of le mouse. The next day we bought some traps and since then have caught several more mice in the attic. Thankfully, none of them have been venturing into the bathroom. Sounds a lot like our first encounter with a mouse in our place. Except the expert mouser was not the man of the house, but the cat of the house. Those little creatures are quick and crafty and can hide in basically any place. Good going for actually catching him. Hopefully you only had a few problem mice and not an exterminator-call-worthy amount.